Heiner Stadler; prepare to learn what those two words really mean. Only then will your brain catch fire. Heiner Stadler doesn't even have his own Wikipedia entry – that's how obscure he appears to be, both within and outside of his homeland of Germany. But the pianist has certainly made his mark upon the 20th century, first with his thick pea soup compositions completely ignore jazz traditions -- and also as a gatherer of unique talents. 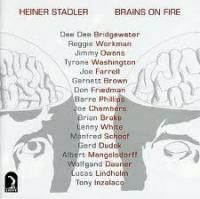 I could fulfill my maximum word requirements for this review just by dropping names of who appears on Brains on Fire, a double-CD career retrospective that features many previously unissued pieces from Stadler. A few worth mentioning are trombonist Albert Mangelsdorff (whose introduces a sweltering big band sound on the excellent 24-minute behemoth "Bea's Flat"), saxophonist Tyrone Washington (who plays a blistering solo on "All Tones"), and a young Dee Dee Bridgewater, who dukes it out with Reggie Workman on the highly unorthodox love song "Love In the Middle of the Air", a track which borders on performance art. Recommended for fans of violently creative jazz.